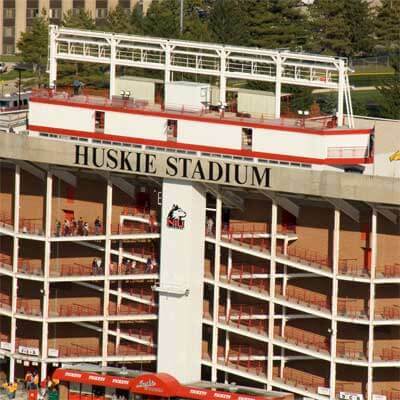 NIU’s Grad Sport Society will host its fourth annual 5K race this year at Huskie Stadium. The race, sponsored by Midwest Orthopedic Institute, begins at 8 a.m. Sunday, April 28, with doors for check-in and registration opening at 7 a.m. Check-in is on the west side of the stadium, and light refreshments will be provided. This year’s theme, “Rise & Run,” is centered around the appearance of the NIU football team in the BCS Orange Bowl. “Orange” is the theme, from the free T-shirt to the ultimate finish line in Huskie Stadium. Participants of all ages are encouraged to come walk or run in this race. Strollers are also welcome; children younger than 12 are free. Registration is $25 today (Tuesday, April 23) or $30 on the day of the race. All paid participants will receive T-shirts and raffle tickets. Prizes also will be awarded for the top placing runners in each age group. Runners will have fun while helping to support “Adventure Works.” Each runner who brings a pair of shoes on race day to donate to “Share Your Soles” receives $5 off the price of registration. The course will start at Huskie Stadium and weave through campus before finishing back on the field, where NIU football players will be present to congratulate runners and sign autographs. Two water stations will be set up along the route. Race Time will be providing official timing at this event; the website will post results online after the race. The 5K race also benefit the GSS organization. Group members want to continue to support students of the Sport Management program at NIU. The GSS previously sponsored Sport Management students with educational trips, including the 2013 Super Bowl XLVII in New Orleans and the Illinois State University (ISU) Symposium. For more information, email gradsportsociety@gmail.com.